The 2016 Day in Washington Supermarket Industry Fly-In was a huge success! Over 250 meetings were conducted with Members of Congress and their staff this week raising awareness on issues of importance to independent grocers. It is important to have these face-to-face meetings with Members of Congress and their staff so that they can better understand the issues that affect the independent supermarket industry. New Hampshire Grocers Association (NHGA) was very pleased with the large number of its member companies that attended the Washington event hosted by Food Marketing Institute (FMI), National Grocers Association (NGA), and Food Industry Association Executives (FIAE). It was the largest attendance of the nationwide food industry for this event in several years. NHGA members met with Sen. Jeanne Shaheen, Rep. Frank Guinta and Sen. Ayotte. In addition, they met with a staffer for Rep. Kuster to discuss food industry concerns. 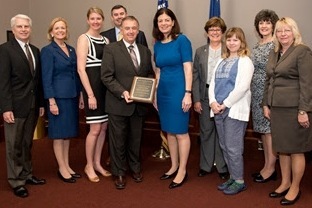 For many, the highlight was NHGA’s nomination and presentation to Sen. Kelly Ayotte of the NGA Spirit of America Award. Since its inception, this award has been given nationally to several U.S. Presidents and Vice Presidents. In New Hampshire it has been presented to Congressional members, governors, members of the General Court, and industry leaders who have worked through government efforts to support and improve the food industry. In making the presentation, John Dumais noted that, “Senator Ayotte has long understood the issues of grocers since being the state’s Attorney General. She has continued that understanding and commitment to supporting food industry issues that ultimately benefits every consumer”. Senator Kelly Ayotte is the second youngest of the 20 female Senators, and the twelfth-youngest overall. First elected to the Senate in 2010, Kelly is ranked as one of the most bipartisan senators.